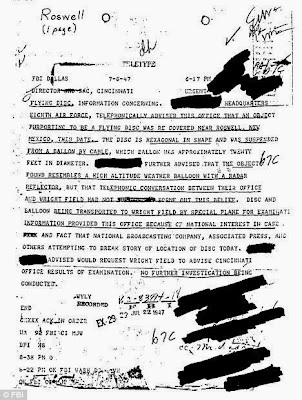 FBI memo that 'proves aliens landed at Roswell'? dailymail - A bizarre memo that appears to prove that aliens did land in New Mexico prior to 1950 has been published by the FBI. Among them is a memo to the director from Guy Hottel, the special agent in charge of the Washington field office in 1950. In the memo, whose subject line is 'Flying Saucers', Agent Hottel reveals that an Air Force investigator had stated that 'three so-called flying saucers had been recovered in New Mexico'. The investigator gave the information to a special agent, he said. The FBI has censored both the agent and the investigator's identity. Agent Hottel went on to write: 'They were described as being circular in shape with raised centers, approximately 50 feet in diameter. Each one was occupied by three bodies of human shape but only 3 feet tall,' he stated. He said that the informant, whose identity was censored in the memo, claimed the saucers had been found in New Mexico 'due to the fact that the Government has a very high-powered radar set-up in that area and it is believed the radar interferes with the controlling mechanism of the saucers'. He then stated that the special agent did not attempt to investigate further. The release of the secret memo is likely to fuel conspiracy theorists' claims of a government cover-up. The town of Roswell in New Mexico became infamous after reports that a flying saucer had crashed in the desert near a military base there on or around July 2, 1947. The headlines screamed: 'Flying Disc captured by Air Force.' Yet, just 24 hours later, the military changed their story and claimed the object they'd first thought was a 'flying disc' was a weather balloon that had crashed on a nearby ranch. Amazingly, the media and the public accepted the explanation without question. Roswell disappeared from the news until the late Seventies, when some of the military involved began to speak out. Another memo published in The Vault from 1947 claimed that an object 'purporting to be a flying disc' had been recovered near Roswell. The disc was 'hexagonal in shape' and 'suspended from a balloon by a cable', according to the memo, marked as 'Urgent', to the FBI director. The memo noted that the disc resembled a weather balloon - but claimed that a telephone conversation between the Air Force and the field office 'had not [word censored] borne out this belief'. The disc and balloon were being transported to Wright Field for further inspection, the memo noted. I don't know if this is a real FBI memo or not but wanted to share this old post from Dailymail.uk.com. I do think something our of the norm happened in Roswell. I think the story of the UFO crash is mostly true but over time some have jumped into the story in an attempt to get attention. I always believed Jesse Marcel, Jr. and in case you didn't know he passed away about a month ago. 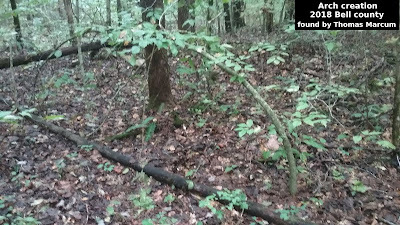 Bigfoot Tracks in Mason County, Wa. Herd of Elk Found Dead - What Killed Them?